The Kovalam beach situated 16 Km. south of Trivandrum city, is one of the best beaches in India. Thiruvananthapuram ( Trivandrum ), the capital city of Kerala, is just 16 km away from Kovalam and getting there is no hassle. But if you are on holiday it is better to stay in Kovalam and visit the city. Thiruvananthapuram has interesting places to see like the Napier Museum, the Sri Chitra Art Gallery, the Padmanabhaswamy Temple , Puthenmalike Palace, Zoo, Planetarium, Veli Lagoon, Ponmudi hill station etc. SMSM Institute,a State owned handicrafts emporium, is the ideal place to pick up ethnic curios and other articles. 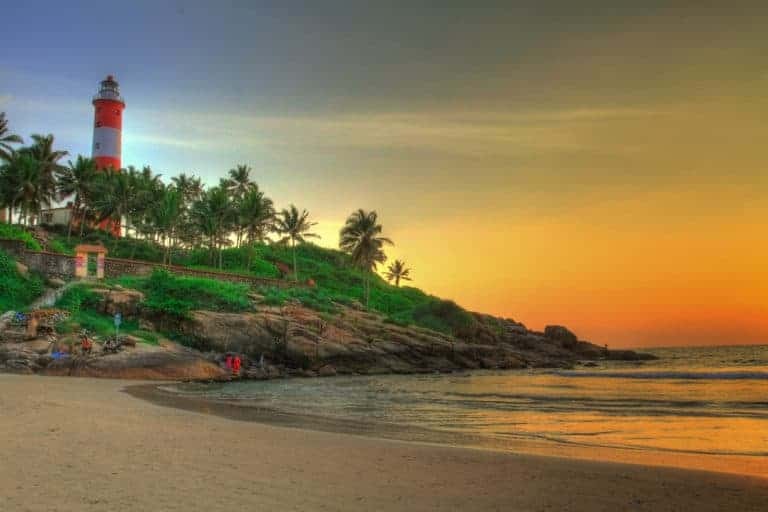 Highly commercialised and very crowded through most of the year, Kovalam manages, against all odds, to retain much of the charm which made it a popular beach in the first place. Surfing and swimming are among the other water sports possible in Kovalam beach.Many people from different countries and cultures, interminlge with each other and get together in this paradise of the South and spend their leisure time joyfully.